So I've had my CycleOps Jet Fluid Pro for 2 years now. I've gotten, maybe, 50-70 hours of riding time on it as I also have rollers that I use quite often. That strip in the middle is very rough and isn't treating my tires nicely. Does anyone have any input? Does this happen normally on the roller surface? Can you off center the tire so that it sits on a fresh spot? Some trainers have screw type skewer holders. You can open one and close the other to slide your contact point over a couple cm. I use a Fluid 2 and have a similar wear pattern on mine, I've used the same tire for 4 winters, it's an old road tire and now completely slick. I'm on my second resistance unit, the first one began to leak oil. this second unit is entering it's third winter and I haven't noticed any additional wear on the tire, just figured I'll ride it until it blows. I wish I had a second wheel for trainer use only. It sounds to me like that's what you have. Yes, just a cheap Shimano wheel that came on another bike. But if you're not riding outside until the spring thaw then it should be a problem to use the same wheel with a different tire. I clean my Fluid2 roller with Goo Gone every once in a while. Removes the tire debris and returns the roller to a smooth surface. That looks like a manufacture defect in the coating of the roller. Look at the owner's manual, from what I can recall there is no mention that a trainer tire must be used. I'd push it up a level or two with CS. Good point. I don't recall ever reading that a trainer tire is required. Rather, it's recommend in order to prolong the life of your racing tired. I'll do some research. Thanks!! As others have said, if it's simply a build up, then just take it off with a solvent. If the metal is actually pitted; that's another story, but one I've never heard of. I use a trainer tire, as it is quieter, ;sat much longer, and does not slip at all, allowing less resistance on the tire. Mine is going on 4 years. Any tire, as it is used builds up heat, which releases compounds in the rubber that adhere to the roller. Many people recommend, and I always do this, simply wipe your tire with alcohol on a rag before riding to clear the tire of the residue left from previous rides. It most certainly isn't buildup. I tried wiping it. The roller is rough as if I would have used sand paper on it! Wow, never heard of that. Can you scrape it with a blade? Got any photos? I'm sure the wizards here can find the issue. If it doesn't come off by either scraping or using sandpaper, then I'd send photos to CycleOps. They are quite good with solving and fixing issues with their products. Hey, sorry I missed that before. I think I'd get back in touch with CycleOps. Maybe heat buildup caused the metal to pit. Maybe that CS rep was having a bad day. Their service is so incredibly good that I would think they'd give you a better remedy. Anyone experience the yellow know locking the trainer to the rear tyre skewers cannot be untighten? It slipping to only one direction. This is sad because I just got this 2 weeks ago. If it makes you feel any better, I have (don't use anymore) a Fluid2 from Cycleops. At one point, i started riding Gatorskins on my back wheel since it could withstand both indoor/outdoor use without swapping out the tire. I didn't have this problem at all when I used indoor-limited tires. It did look somewhat like you pics, but at least mine wiped off at the time. Got the same issue with the same trainer. I can actually feel a dip in the roller surface too. Since moving back to NZ from Scotland I haven't had to use it but I'm sorely tempted to offload it and get a Kickr or possibly a Tacx Bushido. In general I've had a decent experience with the Cycleops but wouldn't buy another. 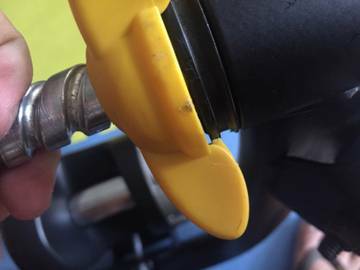 the lock knob on my jet fluid gave up. It cannot un-tighten anymore. this is sad. anyone experience? anyone from cycleops here in slow twitch? I had the same issue. Cyclops replaced at no charge after owning for 6 years. It was a simple install.